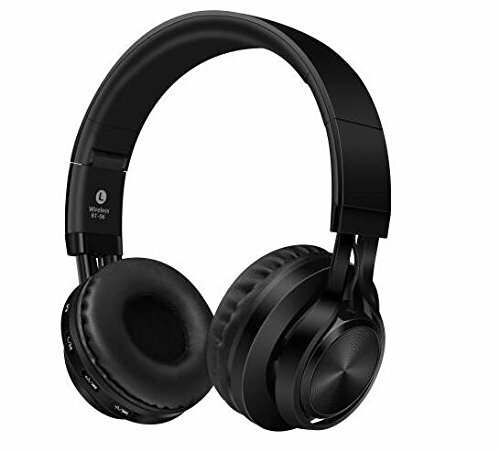 Features:Bluetooth 4.0 Version Chipset provide great cover range and easy connection.360-degree microphone pickup provide high quality phone calls.Clean bass, mid and treble. Well equalized, realtone headphones. Play/Pause, Volume, and Track control.Soft leather earpads and ergonomic design make this headsets comfortable for long time wearing. Foldable and lightweight design for easy storage. Take it everywhere.Up to 300MA battery capacity, make the headphone long standby. harge takes only 2.5 hours for one time, 10-15 hours using and 60 hours standby.Compatible with cellphone, tablet, laptop, Bluetooth-enabled smart TV / Smart TV Box,other bluetooth devices.Powerful Functions All In One: Support TF Card Music Play, FM Radio, Handsfree Talking, Volume Control, Songs SwitchFM Radio & TF Card Play Mode: Support FM Radio, Frequency Range: 87 MHz ~ 108 MHz. Support Insert A TF Card With Downloaded Songs To Play Music, 32GB Maximum Supported. If you have any questions about this product by Sound Intone, contact us by completing and submitting the form below. If you are looking for a specif part number, please include it with your message.